I found one of the keys to winning some of the more difficult scenarios is to use noise cleverly. The horde is always drawn to a lot of noise so buy making a racket and then sneaking off moving to quieter parts of the map, you can complete mission objectives with little bother from the horde. -Remaining players use quieter techniques to move around the map and complete objectives. 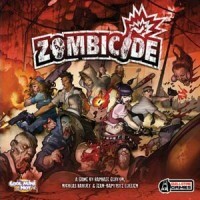 – During the game, the only dice used are those from Zombie Dice. When you’re using a fight action, the red dice are used for weapons needing a 6 to kill (just the pan), yellow are used for weapons needing a 5 to kill and the green dice are used for everything else. Unfortunately, since the chainsaw uses 5 dice and needs 5+ to kill, you need two sets of Zombie Dice, as there’s only 4 yellow dice in the game. – For every “brain” that you roll, you kill one zombie in the area you’re targeting. For every “feet/escape” you roll, you can move one space away (essentially giving every player a chance to be slippery like Josh). If you roll a “shotgun” (rechristened for my purposes here as “stuck”), you can’t leave the space, regardless of how many feet you rolled (you can still kill if you rolled brains). – Brains and feet can stack on top of each other. For instance, if you’re in a space with 4 zombies using the chainsaw and roll 2 brains and 3 feet, you’d be able to kill 2 zombies and leave the other 2 behind without using another action. Since this makes the game easier (both to kill and to run), I use a 4-player limit. This solves Zombicide‘s biggest issue – 4-player games are typically unwinnable (I understand this is fixed in Season 2). 2- and 3-player games let each player control multiple survivors, while 5- and 6-player games have enough survivors to be winnable… but 4 survivors is almost never enough. This modification fixes the issue… each player controls only one survivor, but has slightly better odds due to being able to kill OR escape on their roll. Make sure to visit the game’s website (http://guillotinegames.com/en/) and download the free campaign that was unlocked as part of the Kickstarter stretch rewards. It has linked campaign play, where you keep the same survivors from game to game and allows you to keep a single equipment as well. It contains 6 missions and the ones you play depend on where you exit each mission. Each mission also has a starting Danger Level, which your characters start at the appropriate experience level … but also increases the zombies that will come out. It’s designed if you backed the game and have the extra, third tray of zombies – but I imagine with a little ingenuity (or constant firepower) you can make it work with the two in the base box. Expert-Level campaign it is claimed, can’t wait to see if my group can make it through intact! In the first round before many zombies have spawned it may be best to have a few people exchange items. Letting someone have two pistols early can make a difference in fighting. If there is a room nearby Ned can often be safe without an item and taking a few turns to search. Wanda, Amy, and Josh have greater mobility so it can help to give them the Fireman’s axe or the crowbar so they open doors sooner. So you have mixed all your cards together from the base and all the expansions because there is just so MUCH Zombicide to go around! How do you split them back up again to create lean and custom Zombie Spawn Decks? In terms of Equipment Cards, after the Core Set of Season 1 the individual equipment cards are listed by name and amount for hand sorting but according to the Designer Notes Metagame Matrix the Equipment Cards between sets and expansions maintain the ratio of drawing Standard Equipment vs Rares/Uniques so keeping the decks mixed is not much of an issue. Much like The Descent Quest Vault and the occasional Web Goodies from Flying Frog – the G-Squared support The Zomb with quite a bit of web sweetness. There’s a whole lot of fun to be had at the expense of your ink cartridge. Mini campaigns, character specific quests, and outings that stress different mechanics. There’s also Map Editor utility to help you design your own scenarios. That’s a horde of free support for The Horde. Unfortunately, large buildings often have quite a number of equal cost paths towards the noisiest area (which is through the door you just opened). Because of the splitting rules for zombie movement, this can easily lead to quite a number of extra zombies getting added to the rooms in the building. So upon opening a large building, you’ll want to sweep it as quickly as possible, thus preventing extra zombies to appear. If you decide to open up a large building early on, keep in mind that you can use the rooms you already cleared out as places to search for gear. Try to spread out your kills so that all of the survivors level at about the same time. If one survivor gets some good gear (or one player is having a lucky streak on his dice rolls), he can start to gain experience a lot faster than the other survivors. But since zombies spawn according to the color of the highest-level survivor, things can get pretty hairy if the rest of your group is under-powered. If one survivor starts to get ahead of the others, you may want to have them hold off on their attacks and switch to support actions, like searching and opening doors. Cars can be one of your most valuable weapons and should never be overlooked or under used. Much like the chainsaw, cars are a great way to deal with hordes especially after leveling up and gaining extra actions! Get in a car with at least 2 players so you can swap driving duties every turn and run ’em over! This has been a great strategy with my group especially with 4 players. 2 players drive over zombies while other well equipped players complete other objectives. By killing zombie hordes in this manner it gives the group some breathing room and helps avoid the running out of zombies “all walkers etc… get another action” rule. One of the most unused and overlooked abilities is making noise. The rules state that for the cost of one action you can “make noise in an attempt to attract Zombies. Place one Noise token in this Zone.” This is a great strategy for luring zombies away from objectives, other players that the zombies don’t have line of sight on and corralling zombies at one end of a building so you can get a chance to search in a vacant room. We used this strategy in the revised scenario #7 Grindhouse. We sent one player to one of the zombie exits for the sole purpose of making noise making that exit the “noisiest” and attracting the zombies towards it. We then backdoored the building with the remaining heroes and encountered far less resistance and finally lured the zombies back to our pack of heroes with line of sight and more noise! Worked like a charm. I have found the best way to keep from getting housed in the first two scenarios is to open all the doors you will need opened while still in blue threat level. If you are on yellow or orange, between two doors and a spawn zone, an extra move for zombies or a sewer card can be devastating. When you’re in a tight spot with other survivors and failed to kill all zombies threatening you and your group in your second to last action, passing your weapon on to another survivor with your last action can really help out. E.g., pass your ranged weapon to the next survivor that activates in order to help him take out the pesky runners in the square next to you that are threatening to kill you in the next zombie turn. Of course, this will only help if the other survivor(s) get to play after you do. Open doors to buildings early when every one is still blue, however make sure to pick up equipment also. Some scenarios have several buildings and it make take a long time to open all of them. Make sure to get everyone at least one good weapon before venturing far afield. Keep an eye out for the sewer icons in the upper left corner of the Zombie spawn card. We keep overlooking at least one of these per game. When this icon appears, instead of spawning in the room or spawn point like normal, whatever’s on the card comes out of each manhole cover on any tile that has a player token on it. This makes getting ahead of your party dangerous, especially as the difficulty level increases. -If a player is a space that is part of two tiles, the zombie(s) spawn out of each of the manhole covers on both these tiles. If the player is in an intersection of four tiles – you guessed it, all of the manhole covers on all four tiles! -If there are two manhole covers in a single space, two of whatever’s on the card appear in that space. -These icons are only on a few on special cards. In the base set, I haven’t seen the abominiation icon on the sewer cards. Not sure if there are any in the “abomination pack” expansion. To avoid this, start with the room farthest from the door and work your way back. That way, even if an activation card is drawn, there won’t be any new zombies in the closest room.